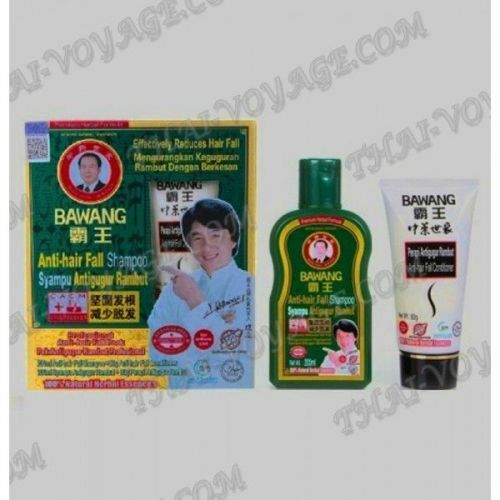 Professional set for hair loss Bawang Shampoo (200 ml) + conditioner (80 ml). Shampoo and conditioner contain a part of the Chinese arborvitae leaves, ginseng, ginger, and other plants. Set hair Bawang effective in the following cases of hair fall: seborrheic alopecia, androgenic hormone baldness and other types of hair loss. Even if You have no problems with hair loss, regular uses can make Your hair voluminous, shiny and healthy. Application: apply shampoo to wet hair, lather in for 3-5 minutes. Then rinse thoroughly with warm water. After shampoo, apply conditioner to hair, leave on hair 3-5 minutes then rinse with warm water. Shampoo and conditioner for the hair and suitable for frequent use.